By coach to Halki village. Following a northwesterly direction from the exit of the rare Neoclassical formation of Chalki we walk to the churches of Agia Marina (single-aisled, cruciform and incorporating ancient materials), Agios Georgios Diassoritis (with a small detour, featuring a host of frescoes), Agios Antonios and Agios Nikolaos/Agios Dimitrios at Monitsia, the early Byzantine triple-aisled basilicas of Taxiarchis and Agios Issidoros (reached via short detouring footpath), and Panagia Rachidiotissa (cruciform). The trail continues in a direction parallel to the gully and then climbs on an oak-forested landscape. An impressive watermill stands where the footpath meets the gully. The trail terminates at Moni, a farming, olive producing village which also has a notable tradition in weaving. 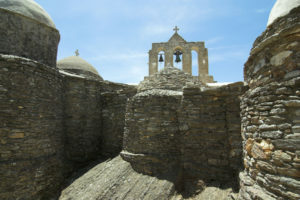 Going back we reach Panagia Drossiani with the triple-alcoved, conical dome and the three adjoining chapels, adorned with frescoes in many layers dating between the 7th and the 14th centuries. Next we walk to Kaloxylos village. Kaloxylos is one of Tragea valley’s most picturesque villages on Naxos, next to Chalki. Situated in an area lush with olive, plane and oak trees, it is well-known for its pretty houses and especially for the rare flowers in their courtyards. The entrance to the village is dominated by the big church of Agia Triada (Holy Trinity), with the carved marble iconostasis and the Byzantine icons.